Fitness professionals have an uncomfortable truth to face: if the goal of our industry is to improve consumers’ lives through better physical health, we are largely failing. Diseases related to sedentary lifestyles are up, basic physical education is down and Jillian Michaels has made upwards of 4 million dollars torturing people on TV. It’s a complete disaster. But it’s true: we’re in trouble and something must be done. The popular refrain is that it’s a motivation issue: that individuals need to be pushed harder to take responsibility for their health. We’re too lazy; we lack willpower and accountability. Personal trainers, coaches and physiotherapists are supposed to be the answer to that problem, delivering knowhow and support directly where it’s needed. Group exercise classes, too, have evolved into dazzling displays of creativity and enthusiasm, ranging from the ingenious to the bizarre, turning simple exercise into everything from a rave to a cult. Even the Internet is being leveraged as a fitness tool, brimming with ultra-convenient, online resources that deliver free workouts straight to your computer screen to be viewed any time of day and performed in any location. It’s a frenzy of motivation. New brands, products and fitness celebrities rise to popularity constantly, all offering books, gadgets and classes that sell brilliantly, each contributing to an industry that, as we speak, is worth more than the GDP of Estonia. So, why isn’t it working? Why is the industry thriving, but its consumers floundering? An answer to this mystery is starting to emerge from the decades of public health data on obesity, physical activity and health behavior: more than just our choices, our health is a product of our environment. Every fitness modality mentioned above is targeted at individuals (or, at most, small groups). They seek to engage the attention and resources of individual people in an effort to sell a choice: buy this product, attend this course, subscribe to this service, read this book. The unspoken assumption (of the consumer) is that making that choice will lead to a lifestyle change that confers better health. As it turns out, that’s a pretty bad bet. Joining a gym or hiring a trainer is not choosing a lifestyle; it’s acquiring a resource. It occupies the same area of your brain as buying a pair of shoes or a candy bar: “I desire [unspecified neurological reward], possessing this resource generates [unspecified neurological reward], therefore I am compelled to arrange an economic tradeoff to acquire this resource.” It’s a transaction that satisfies the need of the moment. “Unspecified neurological reward” can be anything from the cessation of hunger or pain, to social gratification and personal pride. It isn’t a bad thing; life is made up of these little transactions. It’s the basis for what we eat and when we sleep; it’s central to our relationships, our hobbies and what we do for a living. You are constantly making choices like these, sometimes consciously, mostly not. Your environment presents you with alternatives, and you choose. In the end, that’s all a “lifestyle” really is: a mosaic made up of many choices within the context of the world you live in. The fitness industry fails because the choice at the center of all of its products is what to buy, not how to live. You get the reward—the personal pride, the release of social pressure, the assuagement of guilt—when you pay, not when you change. And, it deserves mentioning, some people do change; even a trend of failure includes some success stories. Reproducing the success of a few has proved difficult, however, even as their anecdotes continue to fuel an industry that continually asks everyone else: “What’s your excuse?” Combined with intentionally unrealistic standards and a never-ending list of potential “problem areas”, “fit” morphs from something a few people are, to something everyone is afraid they’re not. There is an irony to an ever-growing majority of the Western world all simultaneously carrying around in their heads the idea that there’s something wrong with them. The truth is that the world we live in—and where all those little daily choices are made—is outrageously out of step with the needs of human health. We live 21st-century lives in bodies with 10,000 year old design specs. Our bodies are built for an environment where food is scarce and energy demand is high. The daily economic transactions we are hardwired to make follow a pretty predictable pattern: consume as much energy as you can and expend as little energy as possible doing it. We do not lack motivation. We are not lazy and we are not weak; like all living organisms on the planet, consume and conserve is what each cell in our bodies is hell-bent on doing. We’ve stayed the same while our environment rapidly changed around us. We’re living in a fantastical version of our ancestors’ wildest dreams: a never-ending surplus of food that requires almost no physical energy to acquire. The consequence is that we can no longer just eat; we have to eat right. We can’t just live, we need an active lifestyle. Making “healthy choices” now means engaging in a whole series of comically counterintuitive behaviors: restricting calories, avoiding energy-dense foods, and taking time away from life activities in order to actually expend caloric energy performing movements that, for most people, have nothing to do with the way they live. It would be funny if it weren’t also potentially life–threatening. 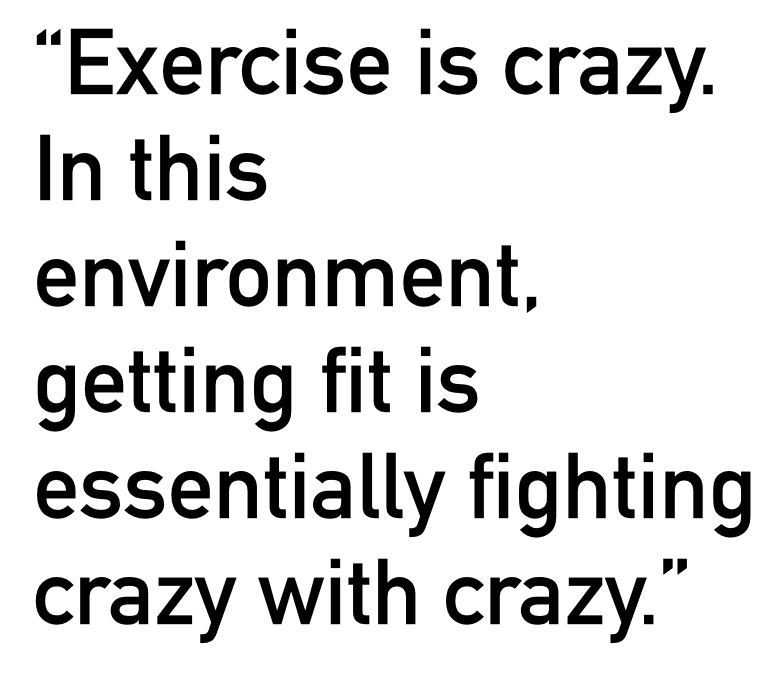 Exercise is crazy. In this environment, getting fit is essentially fighting crazy with crazy, tricking ourselves into moving, eating and living in ways that have no precedent in the history of life on Earth. We can do it, granted, we need to do it to sustain a long and healthy life, but we all need to share a collective chuckle over the absurd measures we take to make ourselves do it. I am proud to announce that this new body ethic isn’t just an idea: it’s an ogranization. Founded in partnership between myself and Patrick Mustain, NBE is about replacing the frenzy of motivation, the hype, the fear with a better understanding of what we’re up against. We’ve built an industry around fighting ourselves, when the enemy isn’t us, and the solution isn’t even fighting. Let’s use what we know to build a new industry. For starters, we’re looking for 1,000 health and fitness professionals who want to become a piece of a larger health effort that also targets environments, not just people. If you’re one of those professionals, sign our pledge. If you’re like millions of others out there who just want to get healthier and feel better, share this with your cycling instructor, personal trainer, or gym-owner, and ask them if they agree with our Six Principles. If they do, congratulations, you’ve got some great people on your side. So so interesting! The UK is starting to approach health in a pseudo type of way to what you’re describing (have a look at http://www.thisgirlcan.co.uk). The tides I feel are starting to turn and no one has so eloquently put it as you so far. I sincerely hope this is the bellwether/tipping point for a new healthy Western culture. Usually I am quite good at seeing the truth in social conventions and passing on the view to others but here you have surpassed me and I actually feel so enlightened right now. This is exactly what I have seen but been unable to formulate coherently in my own head what it is! I really understand now how we have been scared into consuming the product of the fitness industry for fear of being ‘not fit’, of occupying an existence where we arnt seen to actively participate in a lifestyle that has become the newest rage. But if we truly want to live a life appreciating the resources available to us while seeking health and having exercise not be a product to chase and unfitness something to fight against we really need to broaden our understanding and awareness and change our attitudes 🙂 sorry if I’m rambling I just really got excited there I’m showing this to my friends because it is so deadly! As always, you’ve hit the nail on the head. This is exactly what we need: fitness instructors moving away from viewing clients as consumers and towards what is truly important and fulfilling about fitness – health and happiness. Many thanks for the wonderful initiative, and best of luck! In China, people are out in the streets and in parks every evening. They meet in informal gatherings in parks & do tai chi, line dancing, hip-hop dancing, etc. Someone with speakers & an ipod brings music. Different people lead different dances… there’s not one particular leader. It’s informal and fun. Everyone is there – young parents with young children, 70-yr-old grandparents, teens, everyone. This occurs in large cities and small towns all around the country. And guess what? Obesity there is nothing close to what it is here in the US. It is my sincere hope that this succeeds in a world where it is so needed. So, so interesting – scaringly, so so so true!!! Have forwarded to trainers, will post on Facebook!! Can I sign the pledge – I am training to be a yoga teacher….